With iOS 9, Apple introduced a Low Power mode, designed to extend battery life when an iPhone's power is running low. According to the feature's description, Low Power mode works by reducing an iPhone's performance and cutting down on background activity. 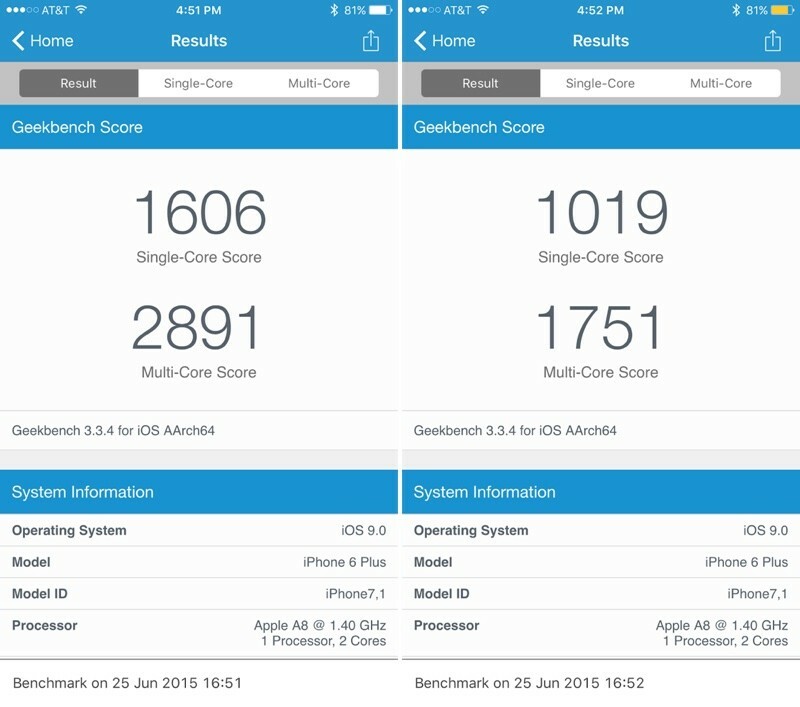 Geekbench 3 has just been updated to work with iOS 9, letting us get a more detailed look at how Low Power mode works and how much it throttles an iPhone's CPU performance when activated. Without Low Power mode activated, an iPhone 6 Plus scored 1606 on the single-core processor test and 2891 on the multi-core processor test. When Low Power mode was turned on, the same iPhone 6 Plus scored 1019 on the single-core test and 1751 on the multi-core test, suggesting there's a significant performance reduction when Low Power mode is enabled to save as much battery as possible. Results were similar on an iPhone 5s, with performance reduced by about 40 percent. We saw single/multi-core scores of 1386/2511 without Low Power mode and scores of 816/1405 with Low Power mode turned on. Low Power mode activates when an iPhone is at 10 or 20 percent battery level, providing a popup that lets users toggle it on quickly. It can also be turned on via the new Battery section of the Settings app. When it's turned on, in addition to lowering CPU speeds, Low Power mode also disables Mail Fetch, Background App Refresh, motion effects, and animated wallpapers. Indicated by a yellow battery icon, by limiting performance and disabling battery draining features, Low Power mode can extend an iPhone's battery life by up to three hours. Other performance improvements in iOS 9 extend the iPhone's battery by an hour even when Low Power mode is not enabled. iOS 9 is currently available to developers and will be released to the general public in the fall. I love this mode but it needs a toggle in the Control Center. Conversely, calculator doesn't really need to be in the Control Center any longer since spotlight/search can make calculations now. Are there any iOS 9 features that are not available on the iPhone 4S or other A5 devices? But that calculator app is so beautiful and I love using it and I won't stop! I love having it in control center so it downer crowd the first page of apps. Or, Apple could just make control centre customisable. I like the concept but the yellow battery color has to change. One comment I got was "the battery icon is urine yellow." If your urine is that yellow you should probably see a doctor. I'm not surprised at the performance throttling, did anyone think the low power consumption was just "Apple Magic" or something? Lowering power consumption can only be done a few different ways. I know most people love the battery life on their iPhones as is, but this should satisfy those who need an extra push at the end of the day. Good on Apple for even creating this mode, most people I know love the battery life on their iPhones as is. I wouldn't say 'love it', but it's alright. However, it can't typically compete with the battery life of flagship Android devices. I give credit to Apple when it comes to optimising their energy usage, seeing what they can achieve even with a relatively small battery. I don't think 'customisable' is a word in Apple's dictionary! That's coming in iOS 10 — the most innovative and magical release of iOS ever.